Sprayed Vinyl Coating: liquid-proof vinyl coating, tough and durable liquid-proof vinyl coating, very low attenuation for special x-ray procedures, skid resistant, cleans easily, resists staining from blood, barium, betadine, etc. standard color white (coated option). Suffix in catalog # for sprayed vinyl coating "C". set of 2 3 x 11x 7"
21 x 7 x 7"
4 x 18 x 24"
3 x 14 x 18"
Developed to facilitate longitudinal arch, lateral projection studies. Made of an Ethafoam material, described as: Semi-rigid, low density, radiolucent material, easily cleaned. Specifically designed to assist patient during lateral chest x-ray exams. It helps patients keep their arms above their head while providing support to keep them steady. Recommended by radiologist and technologists, Valsbar can reduce retakes due to movements, helps minimize radiation. Patient safety is increased by giving them something to hold on to. 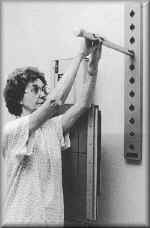 Valsbar can be used while either sitting or standing and is effective for both adults and children. It can also be used for stabilizing patients during upright lateral spines. > Lateral bar locks, securely into position. The Patient has something to hold onto, something to grasp.